As with any large body of water, winds are predominant in the middle of the day due to the heating up of the land surrounding the lake. These winds can whip up the lake surface to create substantial waves and rough waters. This makes for a great windsurfing experience and Bonanza Lake is a popular spot for wind surfing enthusiasts. There are two ways to get there by road, one from Beaver Cove and one from the highway 19 turnoff to Zeballos. I used the Zeballos turnoff route. The junction is about 8 km from Woss and instead of turning left towards Zeballos and Anutz Lake you turn right and then turn right again across the railroad bridge. From there you will follow the main line where you will see pink arrows with the words Ida or Ida Lake painted on rocks or wood. The total distance from highway 19 to Bonanza Lake was 13 km and took me about 30 minutes as I took my time. Along the way I passed through numerous logging cut blocks where firewood is in abundance so if you can, stop and cut some up as there is no fire wood in the campground itself. The main road is quite predominant and where spurs head off of it there is usually the painted signs mentioned above. Once you get within 5 km of the campgrounds the signs stop for some reason so don’t get worried and continue on until you cross a bridge over the Upper Bonanza River and hook up with the main logging road from Beaver Cove. Keep to your left and from there you are about 2 km from the campgrounds. The campground is located on the northeast end of the lake and consists of 15-20 campsites with fire rings, a few rough picnic tables and four pit toilets in rough shape. The campground has obviously been abandoned by the local forest company in terms of maintenance but provides a comfortable camping experience none the less. There are two entrances to the campsites and the first one provides access to the main part of the campgrounds where your campsites are nestled amongst the forest. It has two natural boat launch areas that can be used to put your boat into the water. There are three pit toilets situated in this part of the campground. The campsites are in poor shape so be prepared to fix them up a bit to suit your needs. They are however still rustic and enjoyable. You may have to look around for a picnic table as there isn’t enough of them to go around. At some point some hunters or young kids have abandoned a trailer to rot away and it is an eyesore but until someone of authority removes it, you will have to deal with the unpleasant pollution. The second entrance is about 1/2 km from the first entrance and leads to the main boat ramp where a clearing has been created that hold about 5-8 campers. This spot also gets the most sunlight during the day. There are fire rings and some picnic tables with one pit toilet. When I was camping at Bonanza Lake this is where most of the campers resided. Located on the very northeastern side of the lake is an old marble mine staked in 1981 and further down the road is another lake named Ida and is also very popular among campers. The lake is smaller than Bonanza but offers a unique camping experience also. I will be heading there next summer to write an article and take video footage. Another campsite I plan to visit in the area next summer is Claud Elliot Lake Provincial Park and as before I will write an article and shoot a video. Use the form below to find out how to get to Bonanza Lake Campground using Google Maps. Talking to some of the campers I found out that a few of them were there hunting and others were regulars who come every fall for the great fishing opportunities. There were three motorhomes, four pickup campers and two trailers. At one point during the day when I was walking along the beach towards the main boat ramp I came across some cougar tracks and proceeded to the boat ramp where I met one of the local campers walking his dog. He informed me of a situation where the cougar had approached him and his dog not taking his eyes off the dog and whipping his tail sharply. He proceeded to scare off the cat after getting his attention by yelling and moving towards him. All I could think of was, darn missed a good photo opportunity. One day I was down at the beach a few hundred yards from my campsite taking photos of the sunrise when I heard some crashing in the bushes behind me. I stood very still trying not to breathe too loud in case my photo opportunity was about to present itself. I must have waited for about 5-10 minutes before getting impatient and moving towards the bush to see if there was any wildlife around but was dismayed to find nothing. I can only assume whatever it was caught my scent and moved in the other direction. There are wild squirrels that come right up to you to check you out. I tried to feed them some shelled peanuts but they weren’t having any. 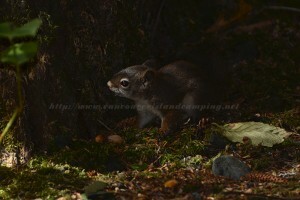 My guess is that they prefer to remove the shells as most squirrels on Vancouver Island do. I also didn’t push it to see what else they may be interested in eating as I am sure they got to be so tame because they have been fed something by the campers. The fishing is very good on Bonanza Lake, however I never got around to trying my luck. After questioning a few anglers that came in to the boat ramp, I found them to have four very nice sized Rainbow Trout about 3-5 lbs. They informed me that they were trolling gang trolls with a worm on the hook and about 25 feet down. Apparently they lost a beauty which broke their 15 lb test line so one can only imagine the actual size to break off that line strength. Of course there could have been other variables like over tension, weak and or old line etc. but it made for a great story and their eyes lit up when telling it. Unless the wind is not blowing you will have to get off the water around 10:00 am to around 7:00 pm in order to avoid getting swamped by large waves. I imagine if you had a larger sized boat the water would not present as much as a threat. Overall I would definitely rate Bonanza Lake a good experience and I will be back during the summer months to see whether the wind is as predominate as it was in the fall. I would assume it is because of the prevailing westerly winds that usually occur during the summer months. Hopefully in the future the local forest company or some awesome volunteers will do some necessary work on the picnic tables, pit toilets and other small issues that could improve the campsite. Other than that, you must check it out as a go to destination for a wilderness adventure and camping experience which compares to other similar free campgrounds on Vancouver Island like Anutz Lake and Klaklakama Lake. That was a great journey. Very glad you enjoyed it. 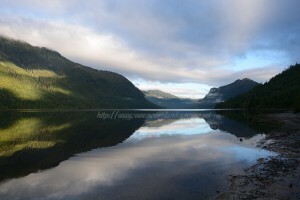 Bonanza Lake is worth visiting to view the fantastic scenery as well experience the remote wilderness first hand. I remember Bonanza lake when I logged the North end of the Island as a new campsite which was maintained. It’s sad to hear that it has fallen into disrepair but that seems to be the way with a lot of forestry created campsites as costs sky rocket for the local logging companies who struggle to survive in the new era of exporting raw logs instead of providing wood for local mills which had spin off revenue and made it easier and more affordable for the forest companies to look after the sites. I too remember great fishing on Bonanza Lake and the wind also was present even back then. My close friend caught a nice 8 pound trout one day while using a spinner from the beach. It turned out to be the largest trout caught that I’d heard of back then. Thanks for the reminder of how much fun Bonanza Lake can be and it is good to hear that the road is passable from the Zeballos turn off. I also remember a back way in north of the Nimpkish Road turn off that leaves highway 19 and heads to Vernon Camp and eventually Gold River. Hi again Lloyd and thanks for your comments. 8 pound trout, that is a nice one and would be some fun reeling in. The campgrounds aren’t in too bad of shape other than old pit toilets and a lack of picnic tables. Hopefully I didn’t paint too dismal of a picture as that wasn’t my intention. I talked to a couple of hunters while I was there in the fall and was told of the back way you mention also. Apparently it enters the Beaver Cove mainline just west of the junction (bridge across Bonanza River) of the road that I took from the Zeballos Road turnoff. Maybe I’ll see if I can find it in the future. Awesome article thanks im going to try my luck kiteboarding Bonanza lake this weekend. ..Im so excited to finally check it out. .
Hi Ryan, glad you liked it. I bet you are going to have fun for sure. Lots of wind and big waves when I was there.